Start, or end your day, with this easy vegan waffles recipe. They’re light, fluffy, made with 5 simple ingredients and ready in about 15 minutes! In a medium sized mixing bowl, combine the flour, sugar, baking powder, oil and non-dairy milk, mix well, until most of the flour lumps are gone. Gently remove and place on a wire rack in the oven until the remaining waffles are made. Serve your waffles with fresh blueberries, strawberries, raspberries or blackberries, top with pure maple syrup, or this easy homemade Blueberry Compote. You may even like to drizzle with vegan chocolate syrup and add a dollop of whipped coconut cream. If using applesauce, be sure to only us a waffle maker with a non-stick surface. These were made using spelt flour, but sub in your favorite. I’ve also used both all-purpose and whole wheat flours, both worked well. Make them gluten free by using a gluten free flour blend, oat flour or buckwheat flour in a 1-1 ratio. 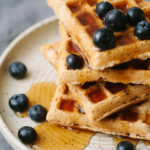 Add-ins: Toss in a small handful of cacao nibs or mini chocolate chips, 1/4 cup of peanut butter for every cup of flour, a handful of blueberries or other diced or small berries, or 1 – 2 teaspoons vanilla extract, or 1 teaspoon cinnamon.